napping in the work place. 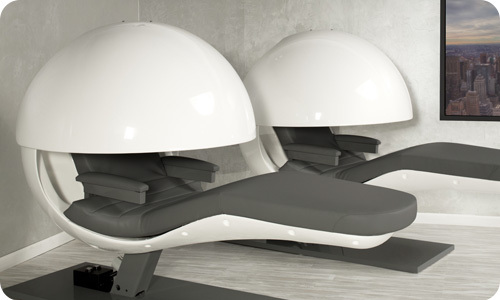 The EnergyPod combines luxurious comfort, innovative technology and timeless design. 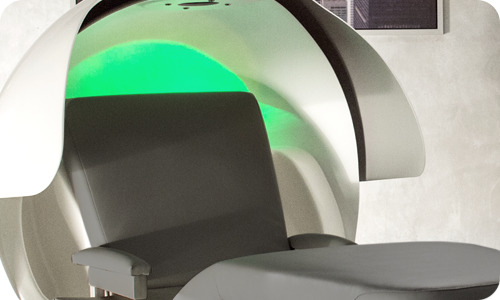 All features of the EnergyPod are designed to help you relax. The EnergyPod is powered by firmware developed around a simple principle: a 20 minute nap is beneficial for well-being and productivity. Features include a status indicator that communicates when the EnergyPod will next be free, and usage tracking to optimize facility management. A napping facility should not only be functional, but also aesthetically fit in your workspace. Our design is stylish and timeless. The classic EnergyPod comes in white and grey, but we can customize to any colour, to match your work environment. The countour of the EnergyPod takes pressure off the cardiac system with the elevation of the feet and relaxes the muscles of the lower back with a slight bend in the knees. The EnergyPod's sphere provides semi-privacy without overly enclosing. Rotate the privacy visor for additional seclusion. Set the timer to the desired duration, or use the one-touch start button for a perfect pre-programmed 20 minute nap. Gentle but effective waking as a programmed combination of lights, music and vibration is executed. Specially composed rhythms play to facilitate relaxation and eliminate surrounding distractions. Listen through the built-in speaker or use optional headphones. It all began back in 2003, because we saw people falling asleep: at work, on the train, in all kinds of places. When we first discussed the idea of napping at work with professionals, what we heard most was that nobody wanted to be caught 'sleeping on the job'. Some admitted that they would sneak off to the toilet, a parked car or an unused conference room to get a little rest. The remainder simply caffeinated their circadian rhythm in an attempt to keep their focus. That’s why we created the EnergyPod: the world’s first chair designed specifically for napping in the workplace. Through our patented solution, we have created the gold standard that provides unique functionality, requires limited space and helps overcome dated stigma related to sleep. Allowing employees to take a short 15-20 minute nap is an easy and effective way to boost alertness and productivity. It also improves mood, creativity and learning. The long term health benefits are also substantial. Leading employers acknowledge the vital need for sufficient sleep and they are supporting this by providing their employees with dedicated rest facilities. MetroNaps works for a broad range of clients and has implemented installations in offices, hospitals, universities and fitness centers in dozens of countries across four continents.